4 stars – Good for iPhones but capacity not enough for Androids. Pricey. Light, & Handy 1-charge Powerbank adequate for most iPhones. However, its battery capacity is inadequate to fully charge most Android phones (instead we recommend RAVPower 6700 or or Anker PowerCore II 6700) and price is on higher side given its modest capacity. It is still great for iPhones and Anker PowerCore+ Mini 3350 battery pack fully charges most smartphones such as iPhone 8, iPhone 7, iPhone 6 and iPhone 5s etc. one time. Anker Powercore+ Mini 3350 power bank has size of a lipstick! Short and light at just 2.7 ounces (about that of an egg or 85 gms). True 3350 mAH battery capacity for 1 charge for most smartphones. Solid build quality. Excellent 18 month warranty and customer support. 3350 mAH is enough to fully charge iPhone 8, iPhone 7, iPhone 6 etc. but it is not enough to fully charge many latest big battery smartphones such as iPhone XS Max, XS, X, Samsung S9, S8, S7 etc. Also the charging speed is slower at 1 amp. Few more dollars more will give you double battery capacity for little extra weight. We recommend RAVPower 6700 or Anker PowerCore II 6700 . For example, Anker PowerCore II 6700 costs just slightly more and offers double capacity and twice the charging speed at 2 amps. Anker PowerCore II 6700 is also our pic as one of the best portable chargers available in the market in the ultra-compact category due to its 5 oz (140 gm) weight. We understand that 1 Amp charging port is sufficient for emergency charging and there is no space for two ports but a 2 Amp port is often very handy! Anker is one of the most popular vendor of external battery banks and Anker PowerCore+ Mini 3350 is one of their bestseller products. Powercore+ Mini 3350 is one of those rare portable battery bank brands that impressed us by not lying about their product capacity and offer promised quality and performance. Please note that PowerCore+ Mini 3350 is upgrade of older Astro 2 Mini 3200. It is available in 5 colors – Silver, pink, gold, blue and black offering plenty of matching and mixing options. The Anker PowerCore+ Mini 3350 will charge most typical smartphones once from 0-30% charge. This makes it an excellent choice for carrying as an additional lipstick sized accessory in your handbag or pocket to accompany your iPhone. The multiple catchy colors also make it an excellent companion iPhone external battery pack. Our recommendation is that buy this PowerCore+ Mini 3350 Anker battery pack if you have an iPhone 6 or iPhone 5S and just need an ultralight small, cheap, high quality and cute charging option for one time. For more than one charge, few dollars more will give you double or more capacity with excellent Anker USB portable battery banks such as Anker Astro E1 or Anker Astro E3 battery packs. Similarly, if you have an Android smartphone or a tablet, it is better to go for a higher capacity mobile USB battery bank for few dollars extra. Anker PowerCore+ Mini 3350 power bank has a robust and solid aluminium metal construction. Fit and finish are excellent overall right to the quality of plastics and the feel of the buttons. The PowerCore+ Mini 3350 Anker battery pack comes with all standard device protections such as battery overcharge protection and safety from shorts and surges. Anker PowerCore+ 3350 Mini uses a high quality Panasonic Sanyo 3350 mAH battery that delivers full advertised capacity (after the usual 30-35% hit that comes with All external battery banks). The high quality of the battery is a testament of Anker’s high build quality and ensures reliability for years. Anker claims a unique PowerIQ voltage sensing and fast-charging capabilities. In real world applications these do not mean much except that this power bank has some voltage sensing that all good power banks have. Also remember that it does not have a true “fast charging” port means 2A or 2.1A or 2.4A charging ports. The standard 1A port is excellent but the fast charging claim can be ignored. 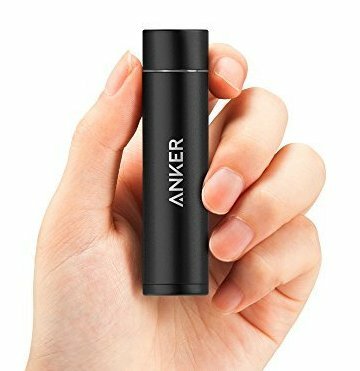 Overall, Anker PowerCore+ Mini 3350 is an excellent high quality lipstick sized light power bank for 1 charge for iPhone 8, iPhone 7, 6 and iPhone 5s. For Android phones and more recharge capacity, we recommend Anker PowerCore II 6700 with twice the capacity for a few dollars more or RAVPower 6700 with twice capacity at same price.